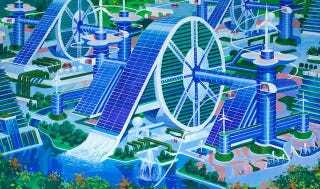 Solar-powered factories, hovercraft apartments, glass towers topped with helipads: No, these are not concept drawings for EPCOT circa 1981. These are ideas for the future of North Korean cities, designed by North Korean architects in 2014. Currently on view at the Korean Pavilion at the Venice Architecture Biennale, these visions were curated by Nick Bonner, the proprietor of Beijing-based Koryo Tours—the group responsible for some of the most incredible Instagram photos taken behind the DPRK curtain. The show includes dozens of images created by architects from Paekdusan Construction and Architectural Research Institute, the two organizations which design and build most of the government-issued projects in the country. For the project—which was four years in the making—the architects were asked to create proposals for what tourism might someday look like in North Korea. It's an interesting proposition to consider since the idea of visitors freely entering the state is a completely foreign concept to residents at the moment. While some ideas are simply wacky, it's also fascinating to see how many elements of urban design that are commonplace in Western world are presented as "utopian" visions for the future. The desire to live in and engage with the natural environment is probably the most prominent theme. Even though the real-world prevalence of bunker-like Soviet-era structures in North Korea don't necessarily infer a design-centric culture, architecture itself holds a prized role in the society. In 1991 Kim Jong-Il wrote a book entitled On Architecture where he described the ideal architectural style for his people: "There cannot and should not be a modern form of architecture that is devoid of national characteristics. Architecture that has been created to reflect the people's requirements in a new age, in keeping with the modern aesthetic feelings and modern civilized life is architecture that embodies modernity, namely, modern architecture." While that particular statement doesn't really make any sense, it's clear that the Dear Leader did envision himself as some kind of master planner, with a specific aesthetic vision for North Korean urban design.